Limelight™ is a newer form of photorejuvenation which provides dramatic results for a variety of benign conditions, including age spots, sun-induced freckles, brown spots, skin redness (rosacea), and other blemishes. For clients undergoing photo rejuvenation to treat rosacea, the redness and flushing can be reduced remarkably. This is done very effectively at a very comfortable energy level. Virtually any part of your body with uneven skin tone, diffuse redness, or sun and age spots can be safely treated. The face, chest, shoulders and arms are the most popular areas for treatment because they have typically had the most sun exposure. One of the prices we pay for our increasingly casual lifestyle is increased sun damage. 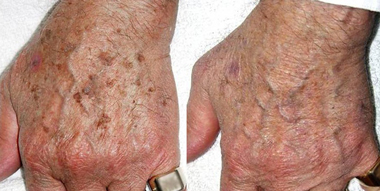 As we get older, some of that damage is manifest by irregular blotchy pigmentation spots, called solar lentigenes, on face, arms, hands, shoulders, and chest. The process is ideal for patients with active lifestyles because the procedure requires no downtime and has a low risk of side effects. The gentle, non-ablative treatments use broad spectrum light to treat the face, chest, neck and hands – virtually anywhere that the sun has caused skin damage. When the pulse of light is delivered, clients will experience a mild pinching sensation. Gel is used to cool the skin before treatment. One to three treatments are usually sufficient. Additional treatments may be recommended, especially for excessively sun-damaged skin. 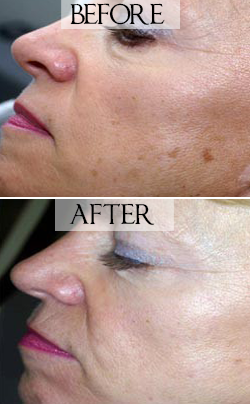 Photo rejuvenations can have a lasting effect on the patient. However, this treatment does not prevent the skin from aging. Patients will still continue to age, and a follow up treatment is usually done after a year or so. What skin conditions does this treatment assist with? What packages are associated with this treatment? The best results are obtained when the LimeLight Photofacial is combined with Laser Genesis and Titan in what is called the 3D Skin Rejuvenation approach. This is the new gold standard for skin rejuvenation and tightening.